Sometimes an installation gets an unexpected boost from nature: so it was in the outdoor sculpture garden at the Central Utah Art Center this week. One of the rare sumptuously beautiful works of art with critical credibility, Roscoe Wilson’s Waste Not, Want Not (see our December issue) saw the artist invert one of his signature objects—a geometric crystal made of recycled cardboard boxes—into stalactites hanging from the gallery’s massive ceiling beams. One of these constructions, that for reasons the artist didn’t elaborate on “didn’t make the cut,” ended up among the sculptures arranged on the lawn alongside the gallery, where it may have functioned as a remote satellite of the circular arrays inside. As it turned out, the context redefined the work: where the stalactites projected high-tech associations—space ships and elaborate, futuristic machines—the boxes outdoors took on the characteristics of the exteriors of the two nineteenth-century buildings that border and create the garden between them, mirroring their rough, mismatched limestone ashlar construction. 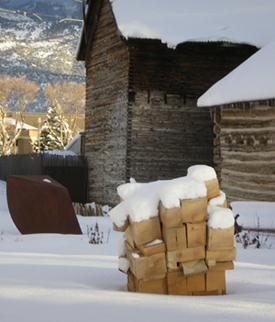 Park City, so the odds are not many art lovers are wandering through the sculpture garden: but the work in question could be seen from cars passing on the plowed lanes of Highway 89 a few feet away.